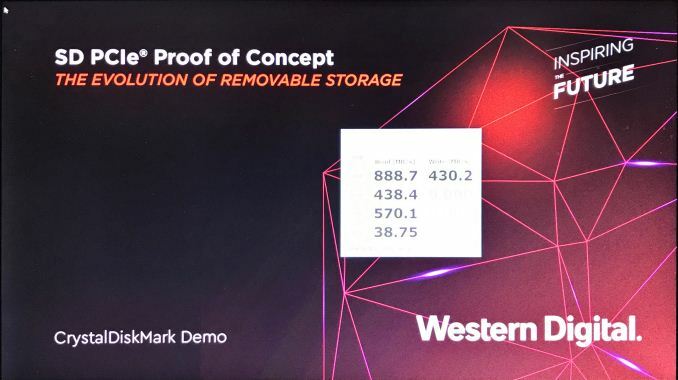 The proof of concept demoed at MWC 2018 delivers sequential reads of up to 880 MB/s and sequential writes of 430 MB/s, which are significantly better than what the current UHS-III standard ofers. However, WD says that PCIe SD cards will not see commercial use any time soon. 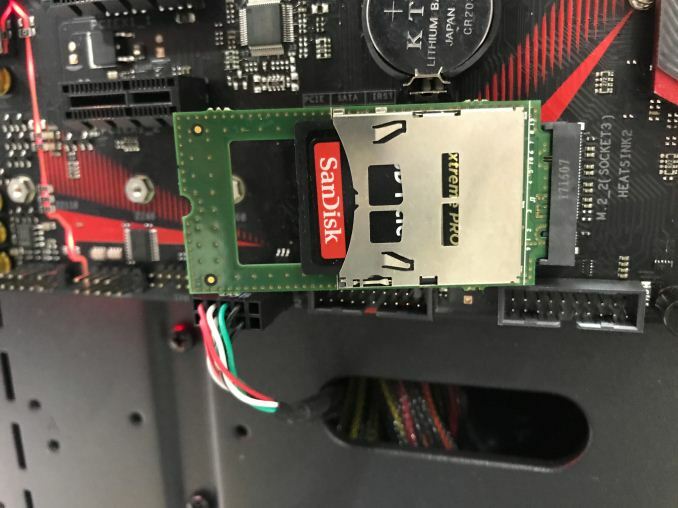 Western Digital and the SD Card Association are trying to push for a fast adoption of the SD PCIe standard in consumer products. Related to this aspect, WD is showcasing SD cards compatible with the PCIe Gen 3 X1 interface at MWC 2018. The demoed SD cards are using an M.2-to-SD adapter that offers a significant boost over the UHS-III standard speeds. According to the CrystalDiskMark benchmark running at the WD booth, The PCIe interface was able to boost SD card sequential reads to 880 MB/s, while sequential write speeds got up to 430 MB/S. WD claims that the PCIe Gen 3.1 can further increase sequential reads to 985 MB/s, which is well above the current 624 MB/s obtainable with the full duplex UHS-III standard. The proof of concept showcased by WD will not come to commercial devices any time soon. This is mostly due to the fact that the SD Card Association is facing problems with the adoption of UHS card readers in consumer PCs. WD notes that the implementation of the new PCIe standard will not require too big of an investment and it also is easier to install than the eMMC/UFS/BGA SSD standards. However, the benefits over NVMe SSDs does not seem to be appealing for consumer PCs that rely on USB sticks mostly. Instead, such adoption might be more appealing for industrial and special-purpose PCs that need more versatile removable storage solutions.